Welcome to the home of Tridek Multicolour, manufactured and marketed by Vadek Coatings Pty Ltd. Tridek is a spray applied multicolour coating for interior walls and surfaces that has already been used on thousands of projects across Australia, New Zealand and Asia. Tridek's coatings are tough and abrasion resistant, far superior to acrylic paint coatings. Ideal for areas of high wear such as commercial building walls in corridors, offices and lift lobbies. 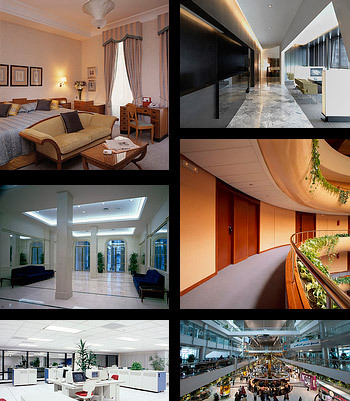 Also ideal for hotel interior walls - guest rooms, corridors and public areas. Retail areas, public building interiors, residential - the list is endless. The seamless, satin finish is fully scrubbable, and mechanical damage can easily be touched up to restore the original effect. Almost any surface that is suitable for normal paint coatings can be coated with Tridek Multicolour. This catalogue contains a large selection of colours and effects to choose from in the Tridek range. This range will be expanded at regular intervals. Also included are full specifications for use, technical and performance data, and most importantly, guidance on how best to make use of the colour services we offer. We are also pleased to claim that our products are fully manufactured in, and owned by Australians. Please note the current Tridek Colour Service Policy.